1معاون امور بهداشتی دانشگاه علوم پزشکی شهید بهشتی و دانشیار دانشکده بهداشت. 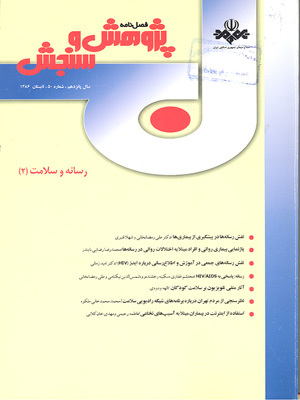 کنترل کمتر از 10 عامل که سلامت افراد را به خطر می‌اندازد (مانند تغدیه نامناسب، فقدان تمرینات بدنی، مصرف دخانیات، سوء مصرف مواد مخدر و الکل) می‌تواند از 70 ـ 40درصد مرگ‌های زودرس، یک سوم ناتوانایی‌های حاد و دو سوم ناتوانایی‌های مزمن پیشگیری کند. آگاهی از این عوامل و ترغیب مردم به تغییر رفتارهای پرخطر، عنصر اصلی و عامل مهمی در ارتقای سلامت افراد و بهبود وضعیت سلامتی جامعه است.استفاده از رسانه‌های جمعی را می‌توان مهم‌ترین جزء از راهبردهای ارتقای سلامت با هدف تغییر رفتارهای پرخطر، برشمرد. از آنجا که رسانه‌های جمعی مهم‌ترین منبع اطلاعات بهداشتی برای جامعه هستند، ضروری است نهادهای بهداشتی و درمانی جامعه، اطلاعات بهداشتی منتقل شده از طریق رسانه‌ها و اثرات آنها را کنترل کنند و با استفاده از فرصت‌ها و رفع موانع، کیفیت و کمیت اطلاعات بهداشتی را بهبود بخشند. Controlling less than 10 factors which endanger human health (factors such as malnutrition, lack of physical exercise, drug abuse, and alcohol addiction) can prevent 40 to 70 percents of early deaths, one-third of acute disabilities, and two-thirds of chronic disabilities. Being aware of these elements and encouraging people to avoid risky behaviors play a significant role in promoting the health of both individuals and society. Employing mass media can be regarded as the most important part of the strategies of improving health, strategies aimed at helping people avoid risky behaviors. Since mass media are the most important sources of health information for the society, it is necessary for the health-care institutes to control the information conveyed to people through the media and their impacts on the individuals and to improve the quality and quantity of these information. Alwan, Aladin (1997) Noncommunicable diseases:A major challenge to public health in the Region , 3 (1). Anderson, philip & petrino, Roberta & Halpern, pinchas & Tintinalli, Judith (2006) The globalization of emergency medicine and its importance for public health. Bulletin of world Health Organization, Bull World Health Organ , 84 (10). Davis, Stephen (2007) Community Stroke Education Using Mass Media, Past Results and Future Implications.stroke, 38. DeJong , William & winsten, Jay (1990) The use of Media in substance abuse prevention. health affairs. finlay, sara- Jane & faulkner, Guy (2005) physical activity promotion through the mass meia: Inception, production, transmission and consumption. Preventive medicine , 40. Glanz, k.& Lewis, F.M. & Rimer, B.K. (2002) Health Behavior and Health Education. Jossy Bass, San Francisco, CA. Hodgson, Corinne & Lindsay, & Rubini, Frank (2007) Can Mass Media influence Emergency Department Visits for stroke? Stroke , 38. Huhman, Marian & potter, Lance & wong, Faye & Banspach, stephen & Duke, Jennifer and Heitzler, Carrie (2005) Effects of a Mass Media Campaign to Increase physical Activity Among Children: Year –1 Results of the Verb Campaign Pediatrics. 116 (2). Hyland, A. & Wakefield , M. & Higbee , Cheryl & szczypka, G. and Cummings, K.M. (2006) Anti- tobacco television advertising and indicators of smoking cessation in adults: a cohort study. Health Education Research , 21 (2). Jones, Marsha and Jones , Emma (1999) Mass Media skill – based sociology. Macmillan Ltd. London. Logan, Robert (2004) Evaluating Consumer Informatics: Learning from Health Campaign Research. Medinfo . Marcus, Bess & owen, Neville & Forsyth , Leighann & Cavillc, Nick & Fridinger, Fred (1998) Physical activtiy interventions using mass media, Print media , and information technology (4). Office of Disease Prevention and Health Promotion and office for substance Abuse Prevention. Mass Media and Health, Opportunities for Improving the Nations Health. Monograph series. Pribble, James & Goldstein, Kenneth & Majersik, Jennifer & Barsan, William & Brown, Devin and Morgenstern, Lewis (2006) stroke information Reparted on Local Television News. Stroke . Schneider, Alexander & Pancioli, Arthur & khoury, Jane & Rademacher, Eric & Tuchfarber, Alfred & Miller, Rosemary & woo Daniel & Kissela, Brett & Broderick, Joseph (2003) Trends in Community Knowledge of the Warning Signs and Risk Factors for Stroke . JAMA , (289). Skin Cancer Module Practice Exercises Module 13: Levels of Disease Prevention (2004) http: // www. Cdc. Gov/ excite. Tsai, Wen–Chen. etal (2005) Effects of a Tobacco Prevention Education Program on Adolescents Knowledge of and Attitude Towars Smoking. Mid Taiwan J Med. Wakefield & Durrant & Terry - Mcelrath & Ruel & Balch & Anderson, & Szczypka & Emery and Flay, B. (2003) Appraisal of anti – smoking advertising by youth at risk for regular smoking: a compatative study in the United States. Australia and Britain American Journal of Public Health, 12. Wakefield, Melanie & Flay, Brian & Nichter, Mark & Giovino, Gary (2002) Role of Media in Influencing Trajectories of Youth smoking. Wakefield, Melanie & Mcelrath, Yvonne & Emery, Sherry & Saffer, Henry & Chaloupka, Frank & szczypka, Glen & Flay, Brian & Malley, Patrick, M. and Johnston, Lioyd, D. (2006) Effect of Televised, Tobacco Company Funded smoking Prevention Advertising on Youth Smoking – Related Beliefs, Intentions, and Behavior. American Journal Of public Health, 96 (12). Yates, B. L. (1999) Media literacy: A health education perspective. Journal of Health Education, 30 (3).